How many of you love the beautifully hand written phrases, quotes, words and letters that you see on Pinterest, your favorite blogs, Instagram, etc? 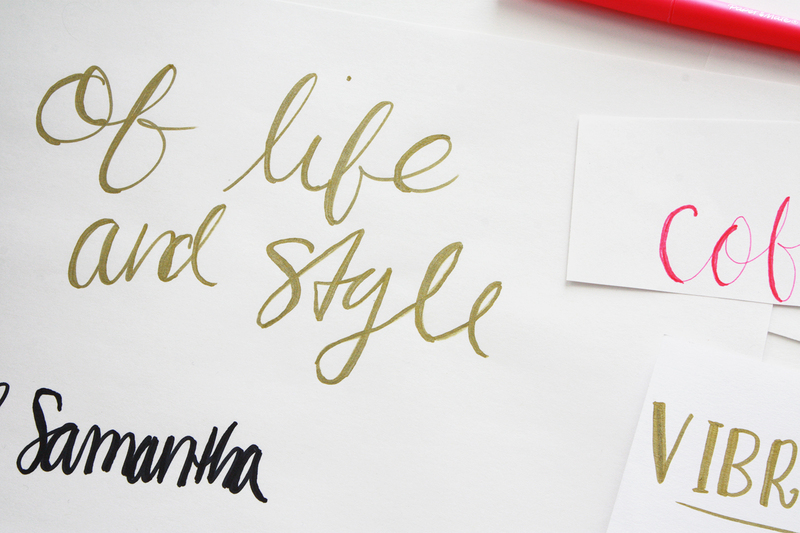 *insert girl raising hand emoji here* Well today I'm going to be showing you how you can fake it in the calligraphy/handwriting world with this ridiculously simple tutorial. So you thought that the only way you could get scripty, cursive, flourishing words is to sit at a desk for hours with a steady hand? Wrong! 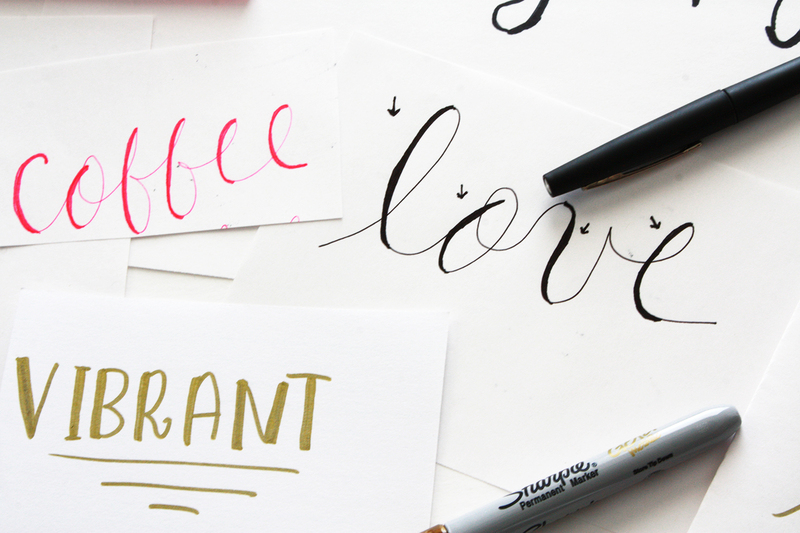 You can get beautifully written faux calligraph-ied (yes I just made up that word) in just a few minutes! It's way to easy and when I found out I was almost too embarrassed that it was just that easy. You don't need any fancy pens or paper or ink to create these scripty words, just a fine tipped pen or a sharpie and some white paper. I used computer paper but any kind will do. 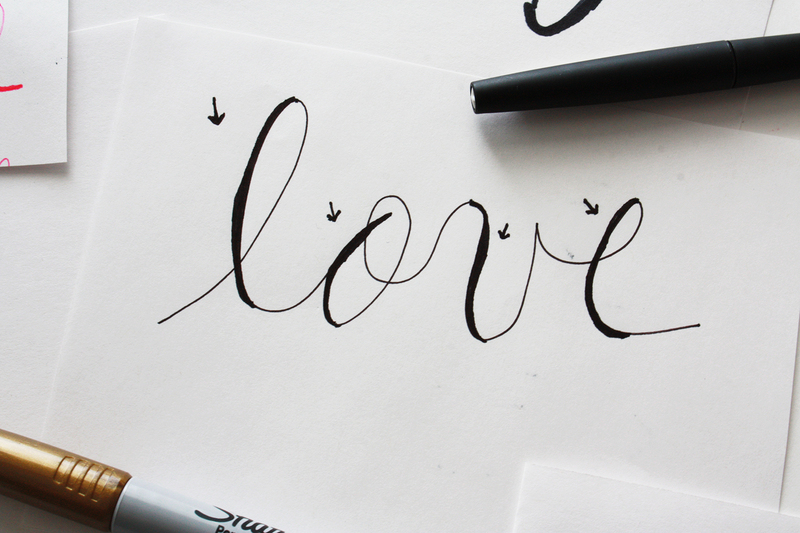 First write out your word in cursive or another scripty font of your choosing. I found that cursive works best but it can work on regular lettering or block too (see 'vibrant' above). Now to get the calligraphy effect once you're done writing out your word, on every downward stroke of your pen you're going to darken up the lines. Make them bolder and darker. So wherever your pen moves down is where you're going to add more ink. See how easy it is?! I found it easier to get that 'traditional' calligraphy style with my fine point Papermate pen than the sharpie. I love the way the gold sharpie looks, I just didn't make my lines bold enough. My favorite letters to write out are any letters with loops, so l's, f's, e's, etc. There's just something about letters with loops that make it look so fancy, sophisticated and professional. I feel like handwriting and cursive is beginning to be one of those lost art type of things. 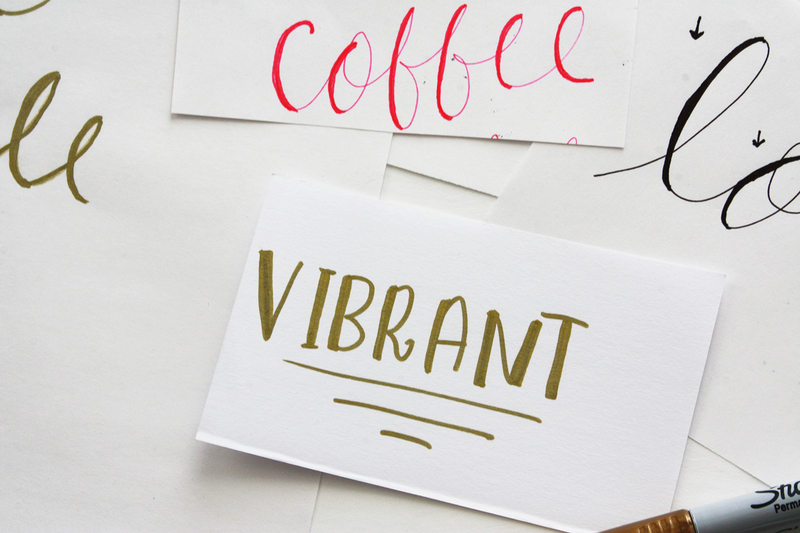 So next time you want to send off a card and want to jazz it up, go ahead and show off your handwriting skills and impress the recipient with some faux calligraphy! 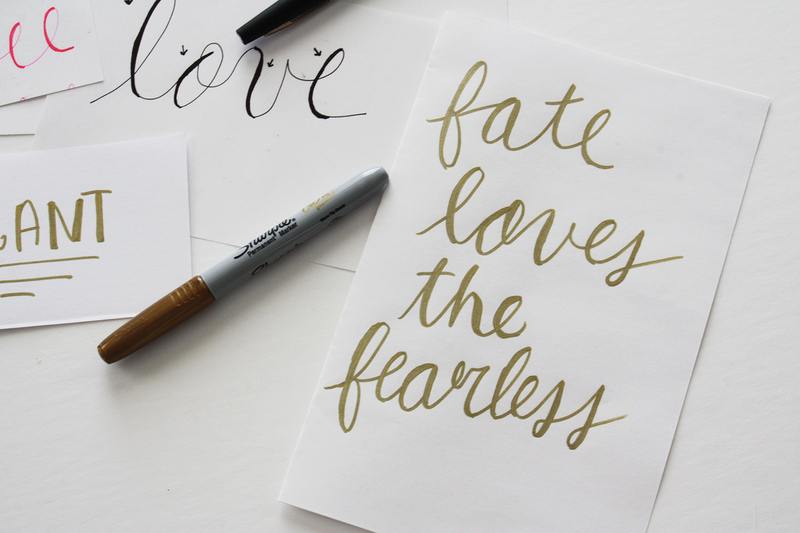 Love faux calligraphy? Have you tried your hand at the real thing? (Haha see what I did there?) 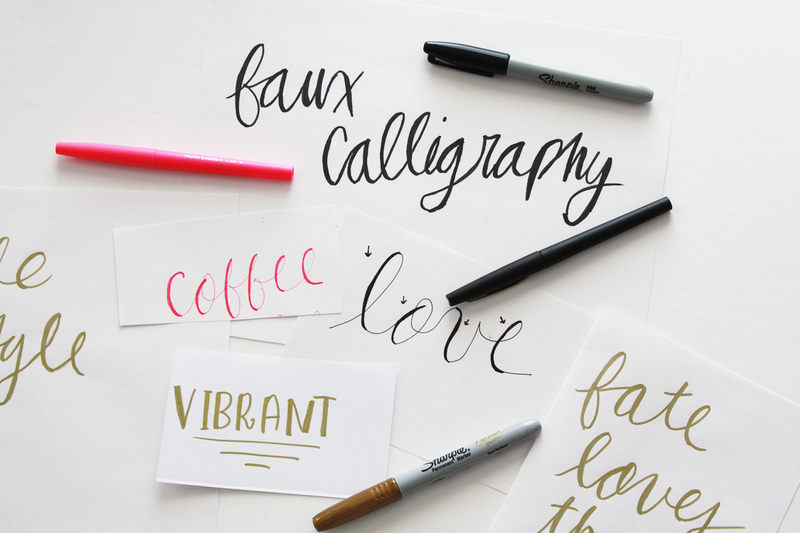 Wanna show off your handwriting skills? Leave me a comment or snap and send me a pic on Twitter or Instagram, @samantha_goble, showing off your fancy new skill! "i don't have bad handwriting. i have my own font"
Thank you Whitney! I love how simple and easy it is to do but how fancy and professional it looks!